I really meant it when I said Women in the Word has changed my life and my walk with the Lord more than any other conference I've attended. Because the Workshop aims to hone my interpretation of scripture, therefore adjusting my understanding who God is, it has a lasting impact on all of aspects of my life and my relationships. The individual preparation of a passage by each woman sets the stage for deep involvement and true humility. We come wanting to know God better. Our naturally imperfect and finite views of God are exposed and graciously discussed in small groups, and we feel cared for. As we merge and sharpen our central ideas we begin to unite around a glorious understanding of our book of the Bible, and how it fits into the larger story of the God's redemption. It is remarkable to discuss God's word with loving women who equally desire to know God better and communicate it more accurately. The kindness and humility of the group leaders is the core, the very heart and soul of this Workshop. It is through their character and loving guidance in our discussions where the mysterious work of the Spirit opens our hearts to his truth. I am forever changed when I leave this Workshop. My orientation towards scripture always gets challenged and refined. This year the message of judgment and rescue, the good news of God's judgment, connected my previously fuzzy understanding of these two seemingly opposite precepts. I am brought to tears when I think of how many lives are impacted by this Workshop. Women who are mothers, friends, teachers, sisters go home with a deeper love for God, His word, and what he has done for us. I pray that God would continue to bless this amazing ministry. 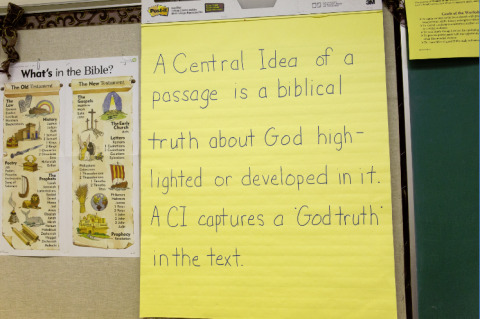 Until 2010, the Workshop focused on helping women who taught Scripture. Then, we added a "Personal Study Track" to encourage women who aren't teachers -- and may never be teachers -- to dig deeper into the Biblical text for the pure joy of knowing the God it reveals. October 2018 was our 13th Workshop. We are a ministry of The World Reformed Fellowship. In 2018, we created three short videos. 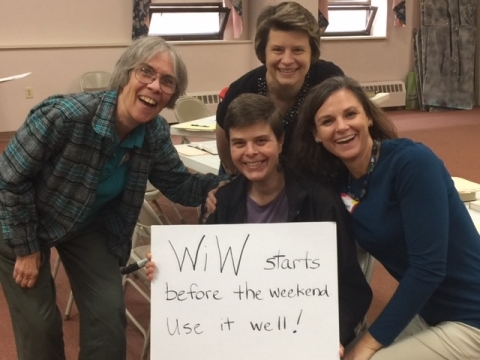 Go to the website www.womeninthewordworkshop.org to learn more about the why, what, and how of a Central Idea. Mark your calendars for 2019: October 25 and 26 at Calvary Church in Willow Grove, PA. Note the later date! Rachel Vendsel will be the Bible teacher for the large group sessions. Her topic is “We Have Seen His Glory: Finding Christ in Old Testament Appearances of God." Rachel is a Licensed Professional Counselor in Dallas, Texas and a graduate of two seminaries. When she lived in PA, Rachel was a Study Group Leader for Women in the Word. Rachel’s teaching times are designed to illustrate what careful Scripture study looks like and produces. The Workshop – by its very format -- proclaims that the Word is worth our work and the Author is worthy of our worship! "I feel that learning about and identifying a Central Idea where God is the subject has and will transform my study of Scripture." Click here for photos of past workshops. Click here for audio recordings of Workshop general sessions. 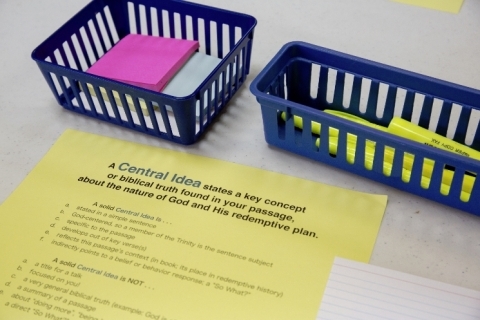 "Good to have motivation to hone my Bible study and teaching skills." "It revitalized my desire for the Word of God and studying it well." "As a stay-at-home mom it was so good to get into deep adult study of scripture." "Learned a lot from the other women and speakers." "Awesome, amazing, new, eye opening, inspiring, humbling, and so helpful!" "The Study Group sessions were the highlight of my time." "My Study Group was a good mix of ages and ministries and excellent sharing." "I loved how hands-on the Workshop was, how we had to practically do what we were being taught." The WRF is grateful to Calvary Presbyterian Church in Willow Grove, PA for the use of their facilities and the involvement of their congregants.